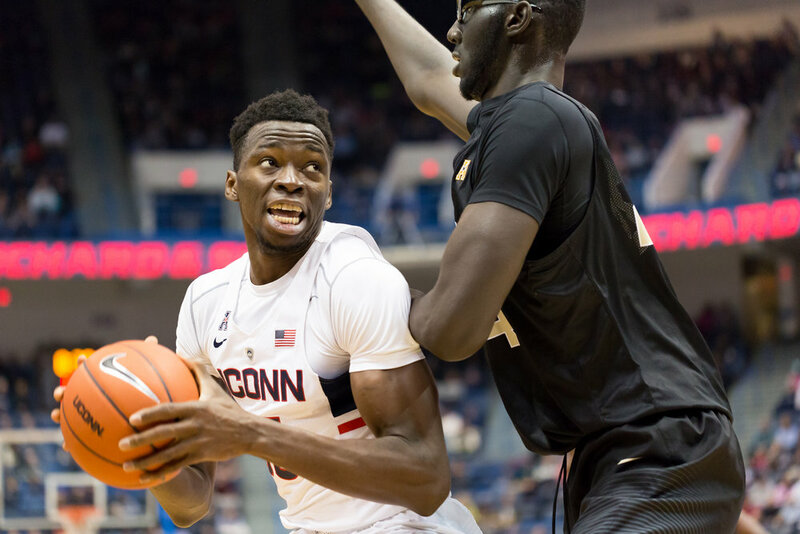 HARTFORD— Bob Diaco may be gone, but the Conflict lives on forever as the UConn men’s basketball team got their first conference victory of the year, a 64-49 win over the UCF Knights at the XL Center in Hartford. Riding a four-game losing streak, including starting conference play 0-3, UConn (6-9, 1-3 The American) was in desperate need of a spark. They did just that by hitting their first four opening shots of the game, including two 3-pointers from Rodney Purvis, to jump out to a 7-0 lead. “I think I’ve been waiting for those the whole entire season,” Purvis said. It was a solid start from the Huskies on the floor all around. They shot 8-for-19 (42.1 percent) in the opening 10 minutes, and their defense held UCF’s middle-of-the-road offense to a stone cold 2-for-13 (15.4 percent) from the floor and 1-for-6 (16.7 percent) from three. UConn did not take their foot off the gas pedal. They continued to penetrate UCF’s (12-4, 3-1 The American) seemingly unstoppable defense and mix up their offensive game, driving to the basket for layups, hitting mid-range jumpers and sinking 3-pointers. After UCF called a timeout upon falling behind 7-0, UConn outscored the Knights 11-6 in the next seven minutes to jump out to a 21-8 lead with eight minutes to play. By the end of the half, UConn had gained seven more points to hold a 35-18 lead, their largest halftime lead of the season. The scoring was evenly distributed, with every player except Steven Enoch recording a point by the end of the half. Purvis lead with 11. UCF tried to mount a fight to begin the second half, but the Huskies were shooting too strongly from the field to let the Knights find any weakness to exploit. Four different players hit shots in the first five minutes of the half to maintain UConn’s 20-point lead. The Knights put together a better effort than in the first half, scoring 31 points, but UConn shot too well from the field to give them a chance to mount a comeback. Each time UCF hit a shot, the Huskies responded in kind. UConn put together 29 points in the second half, making the scoring plentiful and the game still eventful. The result was a final score of 64-49, UConn’s second-largest victory of the season only to their win over North Florida on Dec. 18. Purvis made a tremendous improvement on his shot selection, finishing the day with 17 points on 7-for-13 shooting. He helped contribute to the team’s 27-for-57 (47.4 percent) shooting from the floor. Jackson, who had been stone cold up until recently, continued his strong play by scoring 11 points, six of which came from beyond the arc. What made the Huskies’ performance so incredible was the fact that the Knights are ranked first in the American and second in the nation in scoring defense , holding opponents to a conference-best field goal percentage of 32.2 and a total of 57.1 points per game. For a UConn team that shot a combined 87-236 (36.8 percent) from the floor in their last four games, it was a monumental change to successfully penetrate what is effectively the best defense in the American, with the conference leader and seventh-nationally ranked rebounder in Tacko Fall towering in the post at 7-foot-6. Fall finished the game with only three rebounds. The unsung hero of the game was the defensive effort, especially on the part of Amida Brimah. UCF is average when it comes to offense, sitting in the middle of the American in most categories, like scoring offense (69.4 points per game), field goal percentage (44.8 percent) and 3-point percentage (31.7 percent). But the Huskies held the Knights to the second-fewest points in a half (18) and held Fall, the conference leader and second in the nation in field goal percentage (80 percent) to zero points all game, his second-straight scoreless game. UConn improved their record to 6-9, something that the fans aren’t happy with, but Ollie doesn’t concern himself with.